When I went to CVS Pharmacy this weekend to get my pain medicine prescription filled after my emergency dental appointment, I saw a little Italian cookbook that was half off – just $1.50! – so I snatched it up quickly. The pharmacist and I joked about it, that I would be torturing myself with pictures of delicious Italian food while I couldn’t eat anything solid as my mouth healed. This week I am eating just fine, haha. I made spaghetti carbonara and tomato and basil bruschetta. I do NOT like cooking, so this is a big deal in our family. 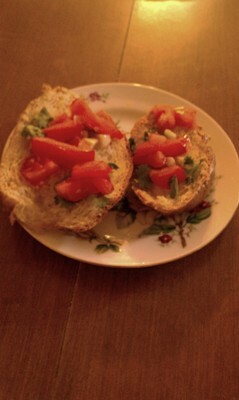 I wanted to share the recipe for the bruschetta with you. It’s simple, fast, and delicious. 1. Combine the oil and garlic. Brush bread slices liberally with oil mixture and place on a baking tray. Bake at 350 degrees F for 10 minutes or until bread is golden. 2. Place tomatoes, basil or parsley, and black pepper to taste in a bowl and mix to combine. Just prior to serving, top toasted bread slices with tomato mixture. I put some tomato slices and cilantro on top of the bread to cook, and with other slices I spooned the tomato and cilantro on top of the bread AFTER it had baked. I thought the cooked tomatoes and cilantro tasted better. I also left cilantro off some slices and just put basil and tomatoes on top of it (to cook) for Leah, since she doesn’t like cilantro. To each her own!